If you need to record a band, you’re going to want a lot of inputs. If it’s a big band, you’ll need more. If you’re planning on using a bunch of microphones, you’re going to need a bunch of preamps too. While a lot of USB interfaces these days offer a lot of inputs, many of these inputs are on digital connections, such as the 8-channel ADAT optical protocol. While this is a great way to offer a lot of connectivity in a small space at a good price, if you want to use it for recording microphones you’ll need to add additional preamps and analogue to digital conversion. Sometimes though, you just want one box that does everything. 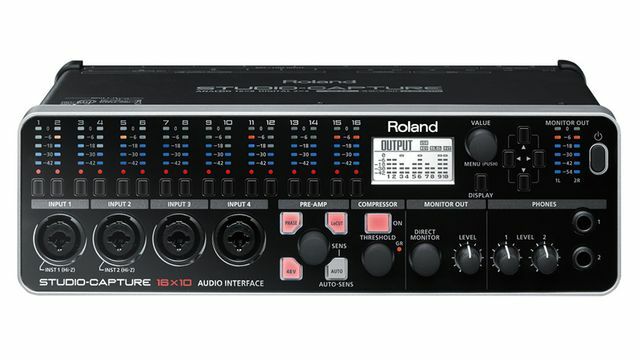 The Roland Studio Capture USB 2.0 audio interface offers 16 inputs, 2 of which can be assigned to the S/PDIF digital input, and 12 microphone preamps with 2 inputs that offer high-impedance instrument inputs. With just this one 2U piece of gear, you can plug in 10 microphones, a guitar and bass directly, and two stereo keyboards, guitar amp modellers or other line-level devices: quite impressive for a single unit. On the output side of things, you get 10 outputs with two headphone sockets and a flexible software mixer system that allows you to create four independent zero-latency monitor mixes with effects for cueing performers. Elektron music making machines: step away from the computer! Buy 2 Boss Compact Pedals, get a free pedal board!